BBC Parliament has become the third BBC service to get a makeover this year, with the TV channel using MP’s return to the House of Commons after the Party Conference Season as the trigger for the new look. Following on from makeovers given to BBC Three (II!) 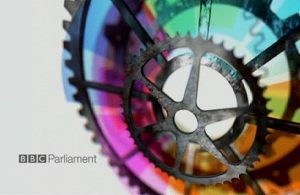 and CBBC, the new BBC Parliament ident and presentation package builds on the previous concept of cogs and wheels denoting the Parliamentary machine, with additional colours reflecting the spectrum of party politics. Although the idents reflect a new look for the channel, with the channel name in the Helevetica typeface, the actual parliamentary coverage still includes the channel’s name in the Gill Sans font previously used for the channel, meaning the new look isn’t consistent across the full output of the channel. BBC Parliament’s new look – the first major revamp since 2009 – contrasts with the fate of BBC One, which has an ident package that is now over 10 years old.